HAUTE DOG The Thai food served at Khom Loi strays well off the familiar path with disheslike kaffir-lime-seasoned rabbit and pork sausage. What? Another story about Ramen Gaijin? Well, yes and no. It's true I've given a lot of ink to Sebastopol's excellent Sonoma-County-meets-Japan ramen shop. But part of what makes the restaurant so compelling is its emergence as an incubator for new restaurant concepts. May featured the second of two Mexican food pop-ups (Polanco), and this month co-owners Matthew Seven Oaks Williams and Moishe Hahn-Schuman debuted their long-gestating Thai food pop-up, Khom Loi. Ramen Gaijin was itself born as a pop-up at nearby Woodfour Brewing Co. If all goes well—and judging by what I ate and the full capacity crowds, it will—the duo may open a Thai restaurant in the near future. Hahn-Schuman is particularly passionate about Thai food, having spent several months in Thailand. 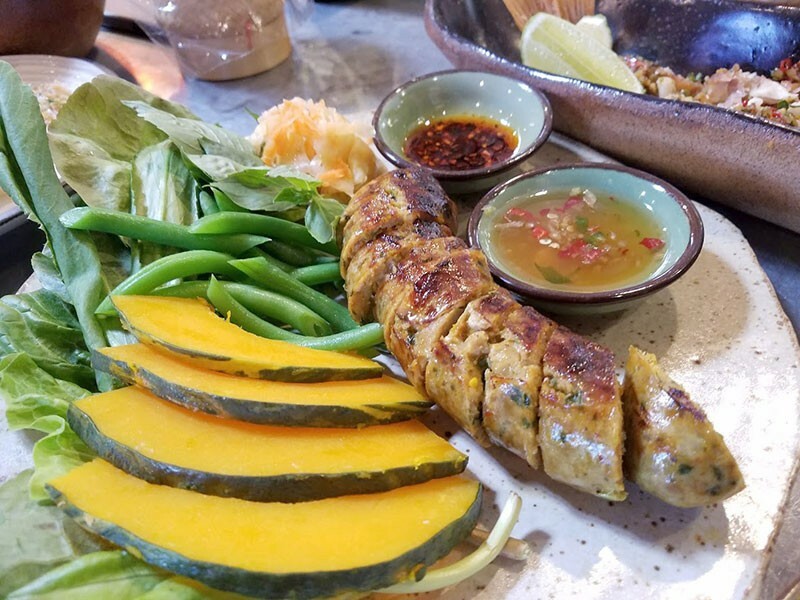 The idea behind Khom Loi is to give diners a taste of Thai food that goes beyond the same old dishes that turn up at American Thai restaurants. There's nothing wrong with pad Thai, green, yellow and red curry or pad prik king, but there's more to Thai food than these familiar dishes. Thailand has jungle lowlands and mountains in the north; it borders Vietnam, Myanmar (Burma), Laos and Cambodia; and it has dozens of hill tribes and ethnic communities—all of which means we normally just get a hint of the country's culinary diversity. Williams and Hahn-Schuman are showcasing some of that diversity with a menu that focuses on northern-style Thai food, like that centered around Chiang Mai, with a sprinkling of Sonoma County ingredients to make it uniquely their own. You may not think of mushrooms when you think of Thai food, but wild mushrooms are a staple, at least in the north. Khom Loi's charcoal-grilled mushroom salad blends porcini, king trumpet and maitake mushrooms, lemon grass, shallots and northern Thai–style cilantro in an electric dressing of lime juice and fish sauce ($12). It's outstanding. Sausage is a hallmark of Laos and northern Thailand. At Khom Loi, the kaffir-lime-laced grilled link ($15) is made with pork, rabbit and sticky rice to create a sausage that has the fine texture of a hotdog but a wonderfully, bright, spicy and aromatic flavor. The best dish by far is the whole fried rockfish ($29). Caught off the coast of Mendocino County, the crispy, sweet fish is slashed and sprinkled with an incendiary blend of Thai red chiles, tamarind and herbs. The flavors on this dish go up to 11. Not everything on the menu is rarefied. The green papaya salad is a Thai classic, but here it gets a fresh look. It's made in a giant mortar and pestle and served with braised octopus and pole beans ($13). It's refreshing and delicious. Khom Loi also serves Thai-inspired cocktails, too. My favorite is the boozy 3 Baht and a Dash, a blend of rum, allspice-infused liquer, Velvet Falernum, and a Rangpur and kaffir lime shrub served over crushed ice ($11). "Thai food can be amazing, but there's not much around here and we want to do it," says Hahn-Schuman. Khom Loi, 6948 Sebastopol Ave., Sebastopol. 707.827.3609.